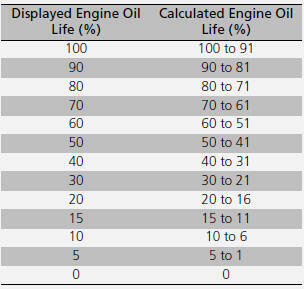 If the engine oil life is less than 15%, you will see the Maintenance Minder messages appear on the multi-information display every time you turn the ignition switch to ON . 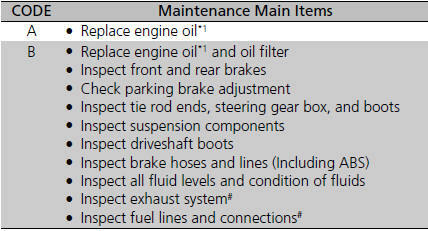 The messages notify you when to change the engine oil, or when to bring your vehicle to a dealer for indicated maintenance services. 2. 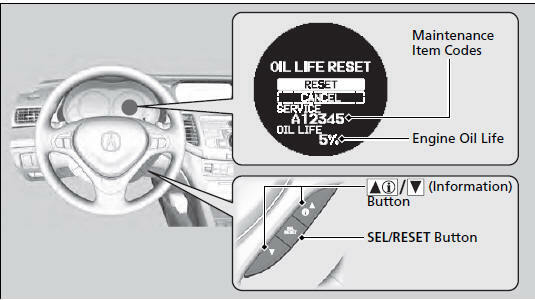 Press the SEL/RESET button repeatedly until the engine oil life appears on the multi-information display. The system message indicator ( ) comes on along with the Maintena Minder message. *1: If message, SERVICE DUE NOW does not appear more than 12 months after the display is reset, change the engine oil every year. *2: If you drive primarily in dusty conditions, replace the air cleaner element every 15,000 miles (24,000 km). 2. 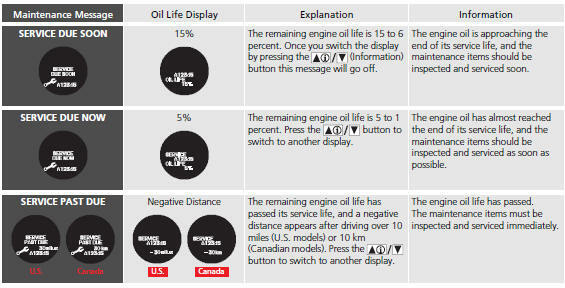 Display the engine oil life by repeatedly pressing the SEL/RESET button. 3. Press and hold the SEL/RESET button for 10 seconds or more. 4. Select RESET with the button. - The service code will disappear and the engine oil life display will return To cancel the oil life reset mode, select CANCEL, then press the SEL/RESET button.